I feel like Pinkie Pie has gotten louder and more shrill over the seasons. Like early on, she was a little obnoxious, but now days her preferred communication method seems to be SCREAM AS LOUD AS POSSIBLE AT EVERYTHING and when I'm watching pony on a tablet or something the EXCEEDINGLY LOUD PINKIE PIE causes all sorts of fun ear pain. She should be a little quiter. She can still be obnoxious and spontaneous without YELLING EVERYTHING. We've had a ton of friendship lessons on the show, alota good ones too! But there are alot missing - some that are VERY important! When I first started watching this show, I thought this show would solve my friendship problems I keep having, and I take friendship VERY seriously! I treat everyone like they're my friends, even if it's not vice-versa, but I'm no idiot, and that's where my problems come in! First off, how am I supposed to know if someone is taking advantage of me? How do I know they're being kind and hanging out with me cause they like me, or are just being nice to make themselves look better; or "pulling a Rarity on me" - just telling me what I wanna hear to give me false hope? Why would people just cut contact with me, or just decide not to be friends with me anymore without a good reason? There's also compromising - I compromise alot for people, yet they don't seem to do the same for me. In the show, it seems like everypony has such an easy time making friends, and yet it's so hard for alot of us! Look at Pinkie, she's able to make friends with EVERYONE! She even successfully befriended Cranky? WHY?! I've been trying to be friends with everyone I meet for years! It's so misleading! I don't care if it's a cartoon, that's just so misleading! There are alota different friendship problems out there that this show really needed to do! It did help me in some ways, but there are other more important ones I still need help with, and I'm sure alota other bronies need them too! We're not allowed to give the staff story ideas, but friendship problem ideas shoulda been allowed! As a particular prolific pony prose producer penned: “[T]echnically...all fanfics are fix-fics... if we’re writing stuff that doesn’t happen in the actual show.” (Jay David, “Best Fix-Fic?”) And while the story comments have since been lost to the compacting of his many stories, I still remember people saying that not all fanfiction should be classified as specifically “fix-fics.” Both the tone of the comments and the story suggested a prejudice against fix-fics, with the comments specifically classifying them as fanfics designed specifically to go against something presented in the show. However, this isn’t necessarily a bad thing. I read something here earlier about how much the fandom had become self-sufficient over the years; unlike most fandoms, we don’t truly need the show anymore. 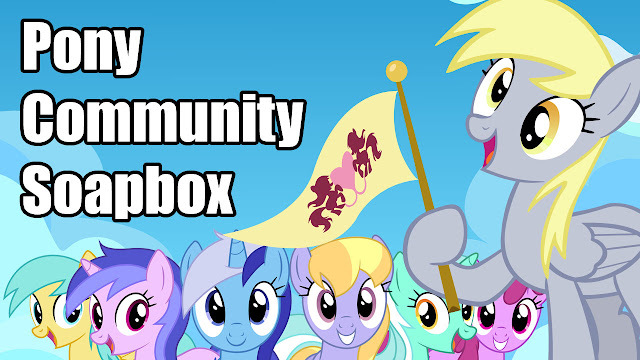 We have so many creative people in our community, that we’ve taken these little ponies and really made them our own. And while digging through EQD looking for the specific post proved unsuccessful, the point still stands. For example, Button Mash never spoke in the show, but we all know what his voice sounds like. So fix-fics aren’t something to look down on; they’re just another person adding their little world to our ever-expanding universe. I love pony too much to see it come to an end. How will I ever go back to watching regular stuff without knowing I have new pony stuff on the horizon? Is this really a world we want to live in? Hopefully we have enough people making more pony. I don't know what I will do when I browse my favorite sites and don't see any of it anymore.